It’s no secret there is a presidential election next week. 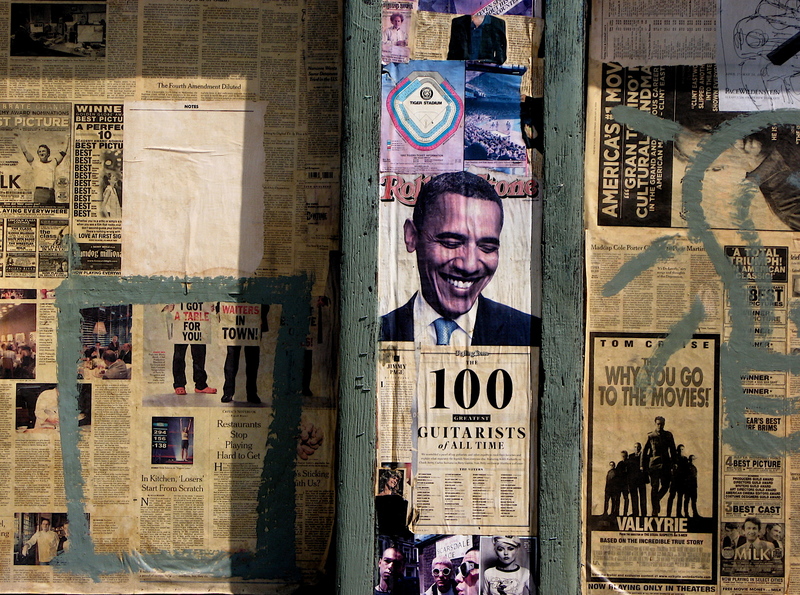 The airwaves have been saturated with political ads. Direct mail pieces spelling out how to vote in large letters have been flooding mailboxes. Radio ads featuring a candidate’s voice seem to dominate the precious time between songs, and those pesky political robo calls are filling answering machines and voice mail boxes for the past few weeks. 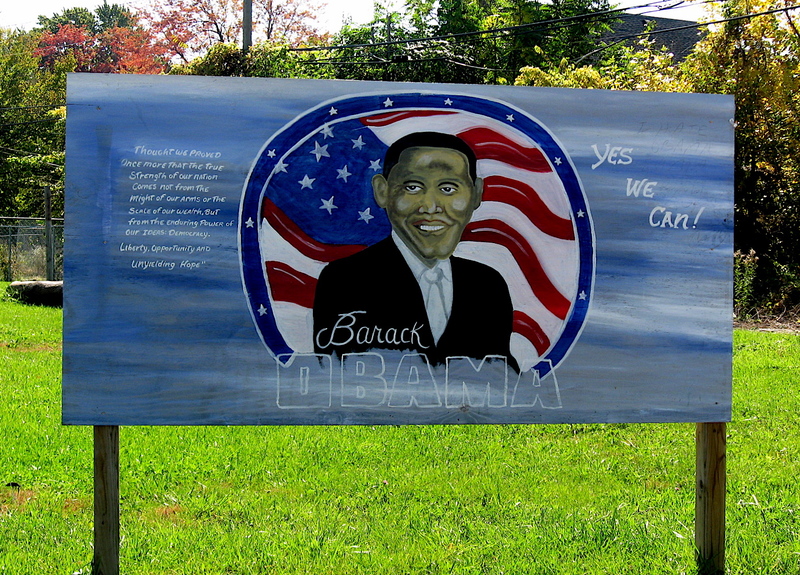 There are also large images of political candidates adorning the sides of busses and billboards with their “vote for me” smiling face peering down on traffic and pedestrians. In many parts of Detroit, political messaging seems to be a little different when it comes to ads for presidential candidates. 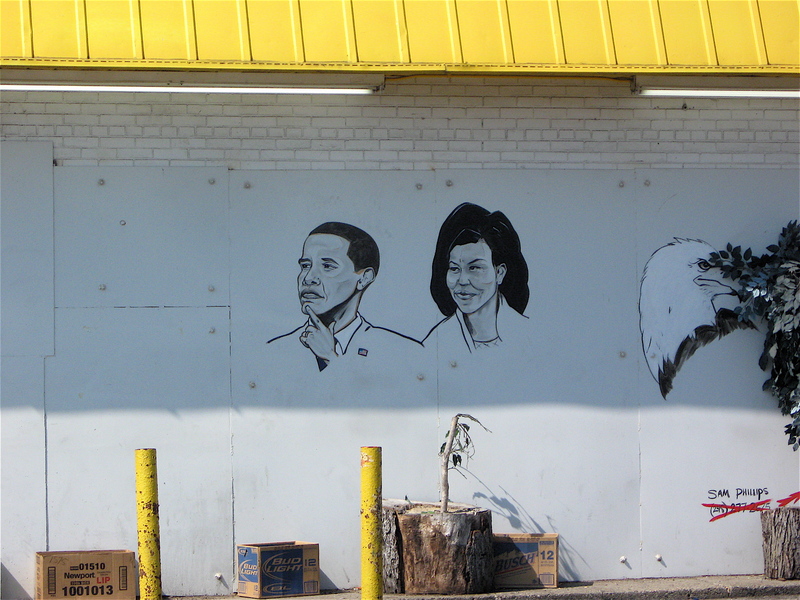 The biggest thing I notice about them while riding the streets of Detroit is the lack of Romney messages. I’ve not seen any, with the exception of a few bumper stickers on cars in parking lots, or on those parked along Woodward Avenue and other streets during a major downtown event. That makes sense, considering Detroit’s long history of supporting the Democratic Party and its large African-American population. 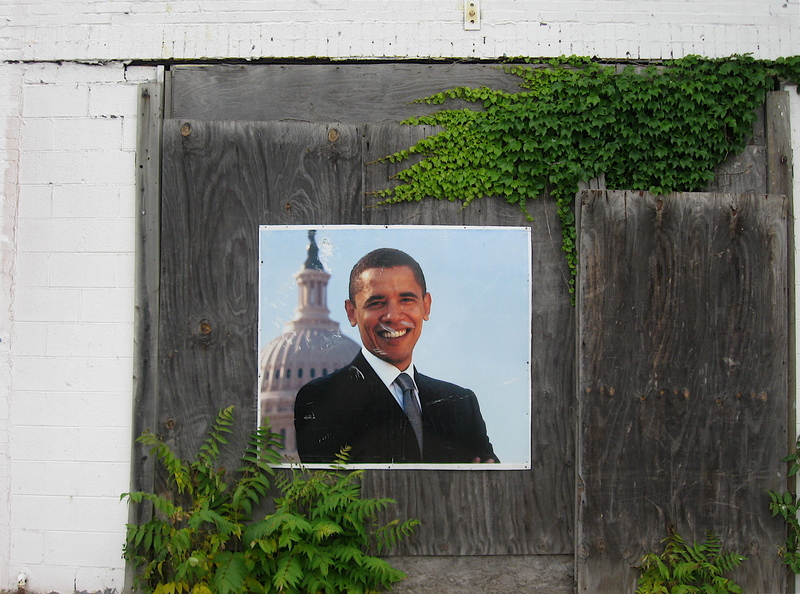 Bicycling around the city, it looks to me as if Detroiters have taking the campaign in a different direction when it comes to President Obama. It appears to be more of a grass-root effort that relies on visuals of the president. 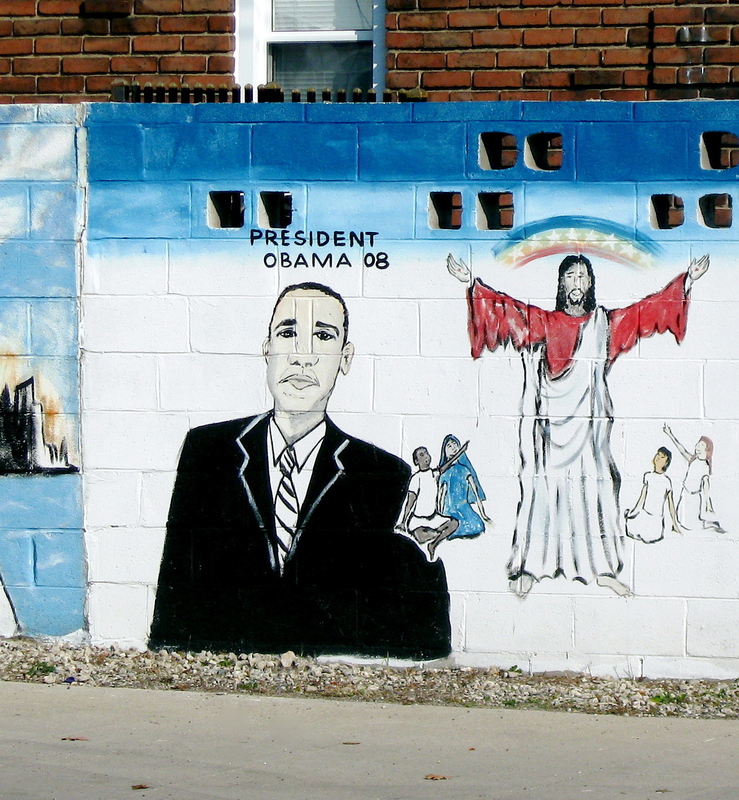 They aren’t the normal mass-produced posters, or billboards from the local campaign headquarters that are strategically placed across the city, but hand painted renderings of Obama found on various buildings and homemade, stand-alone signs. Some are holdovers from the 2008 campaign and are still in pretty good shape despite their age. I’ve seen mostly four-color paintings of the president, but I’ve also spotted a few simple black and white versions as well. 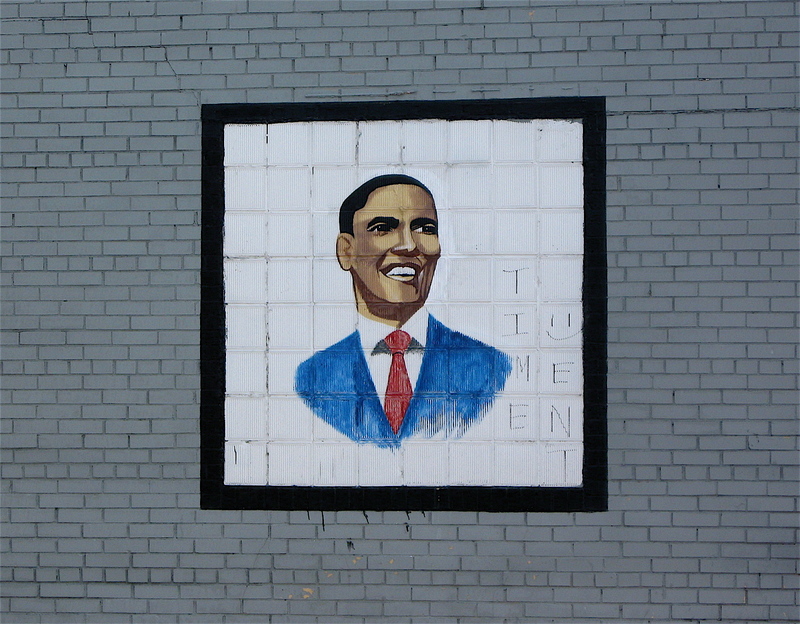 Overall, the urban art is in proportion and offers nice details, but there are a few that look cartoonish. 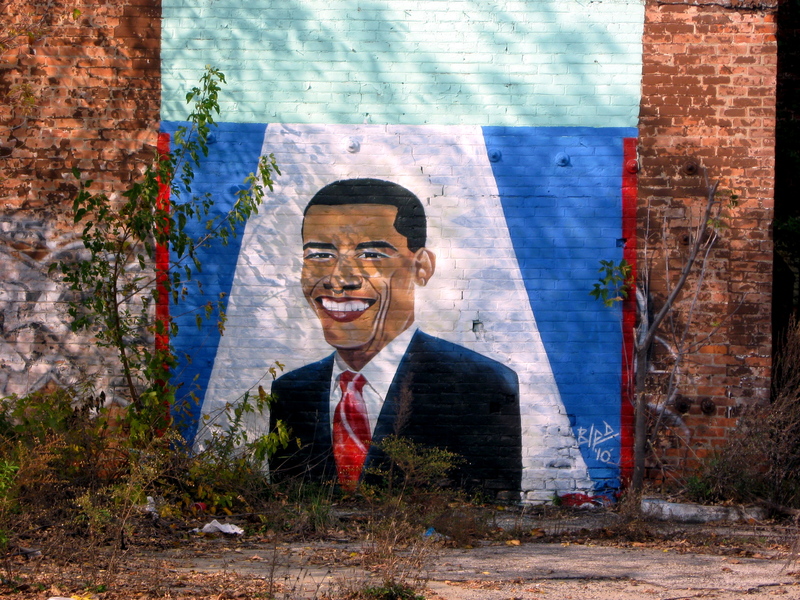 Based on what I see, it is obvious to me that Detroiters support Obama. No matter what your political party affiliation may be, it is important get out and vote! It’s your right and you can make a difference. 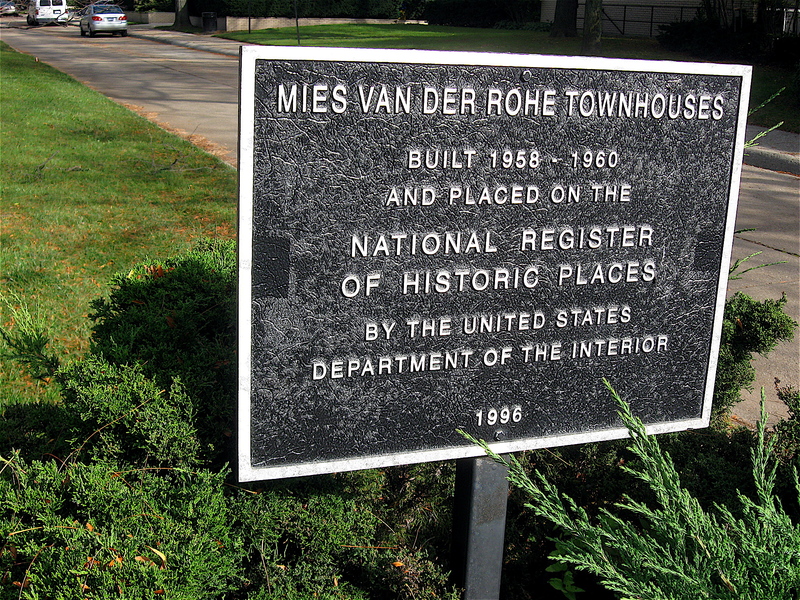 Detroit is fortunate to have the largest collection of buildings anywhere in the world designed by famed architect Ludwig Mies van der Rohe, one of the greatest designers of the past century. 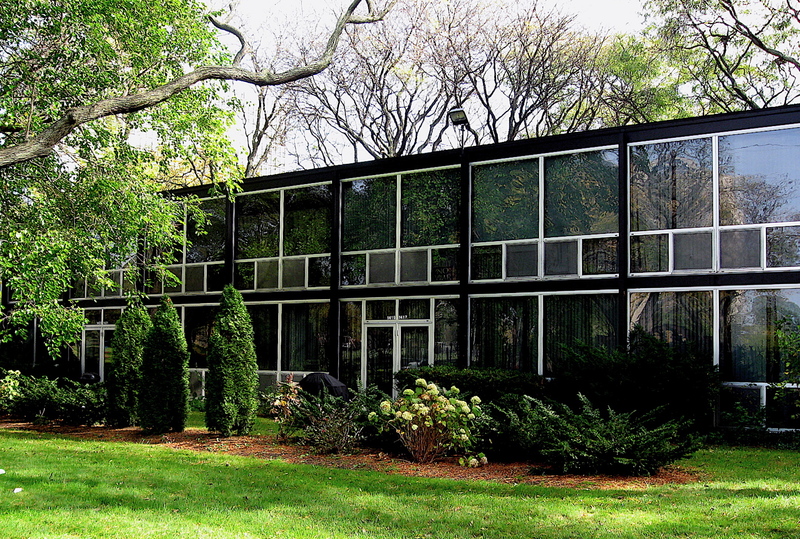 The International style development, listed on the National Register of Historic Places, sits on a 42-acre lot on the east fringes of the city’s downtown area. It includes three high-rise buildings and 21-multi-unit townhouses. 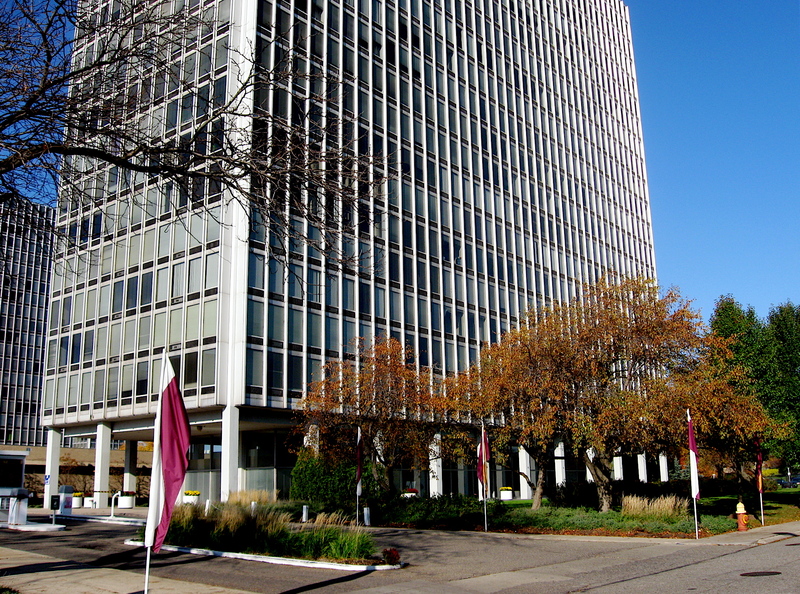 The development, built over a three-year period starting in 1958, incorporates a large green space known as Lafayette Park. Two of the high-rise buildings are located on the east side of the 19-acre park that includes walking paths and an elementary school. All of the residential buildings in the complex are constructed of aluminum and glass and feature floor to ceiling windows that create a sense of openness and spaciousness. The buildings are stark in appearance and feature exposed outer, steel skeleton frames that are part of the overall design. Although there are a few single story units, most of the townhouses are two stories and all of the cul-de-sac streets and parking lots in the development are set about four feet below grade. 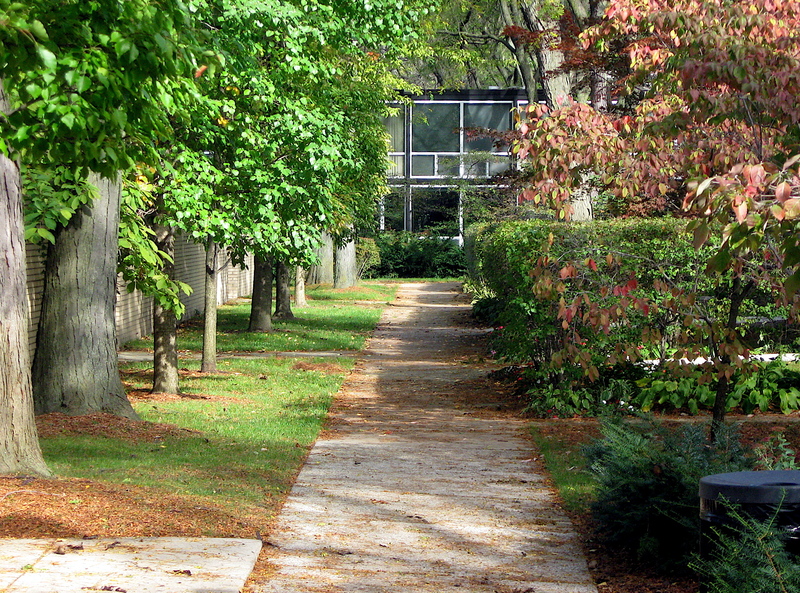 The lots and short streets are ringed with lush landscaping, rendering the cars almost invisible when looking out of the ground level units or from the surrounding sidewalks, much like a private park. While riding through the area, not only am I constantly impressed with the simple architectural design of the townhouses, but the serenity. It’s a relaxing and peaceful setting. A direct contrast to the harsh city environment that is literally less than two blocks away. The extensive landscape scheme complements the sleekness of the structures making the development feel like a natural, country setting but with a subtle urban edge to it. Too me the complex is a masterpiece in urban design. Although the three twenty-one-story apartment buildings in the development stand alone, they too take advantage of the surrounding green space. 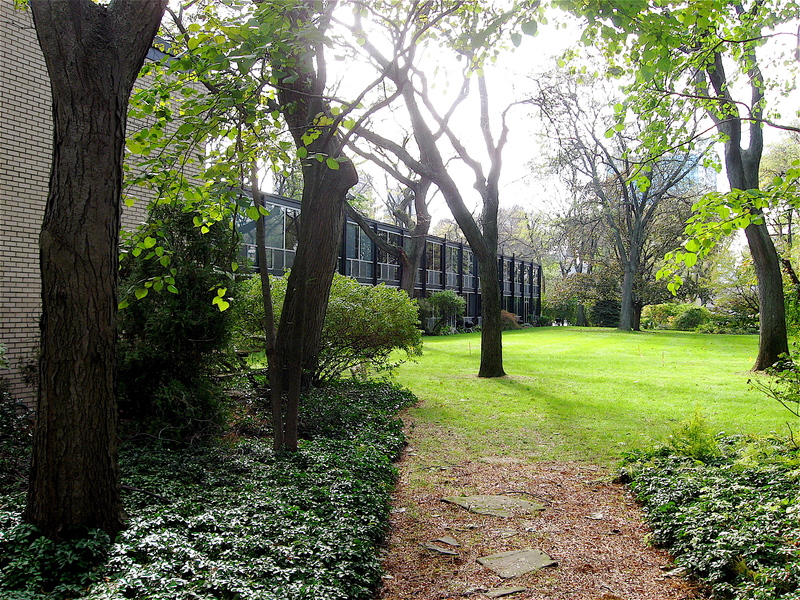 The apartment building known as the Pavilion sits close to the townhouses and like them, it is surrounded by a landscape design that enhances the building. The structure also has floor-to-ceiling windows that look out at the adjacent park or the city skyline. 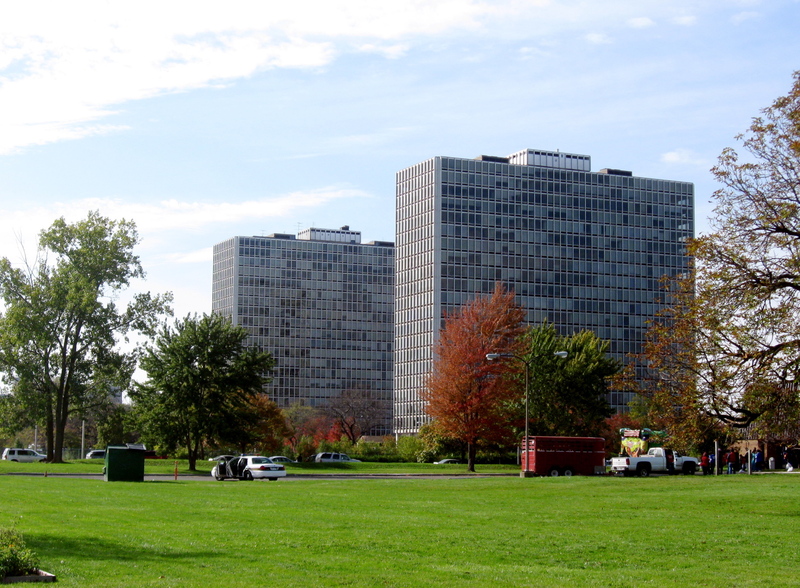 The two other apartment buildings, named Lafayette Towers, are further east and they are replicas of the Pavilion. They are separated from the Pavilion and the townhouses by Lafayette Park. The park’s 20-acre expansiveness compliments the overall scale of the three high-rise buildings, making them seem smaller than what they are. No matter the time of the year, it’s always a peaceful, quite bike ride through the development. In the spring, the historic district is full of colorful, blooming ornamental trees and flowers that highlight the buildings and surrounding environment. 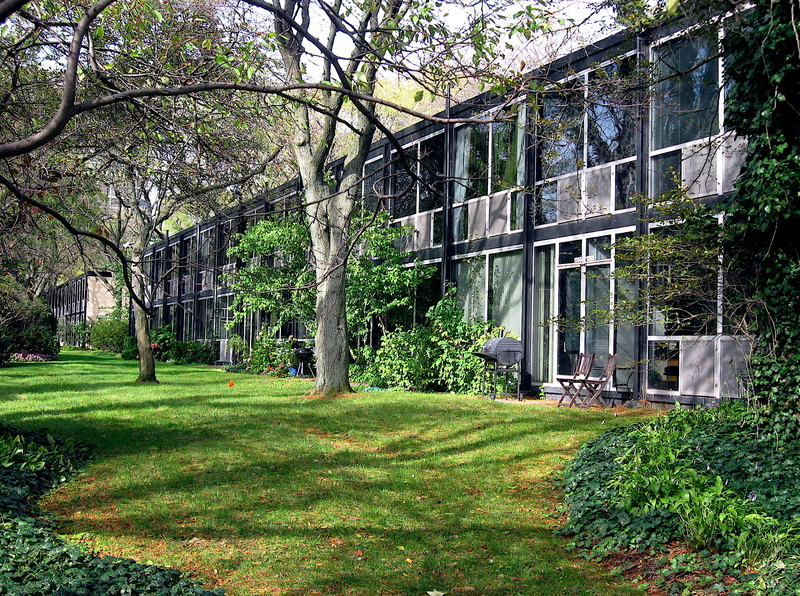 In the summer, the thick leaved trees and bushes soften the starkness of the glass buildings. The fall season offer an array of vibrant natural leaf colors that reflect off the windows, before they drop, revealing the beauty of the timeless buildings. 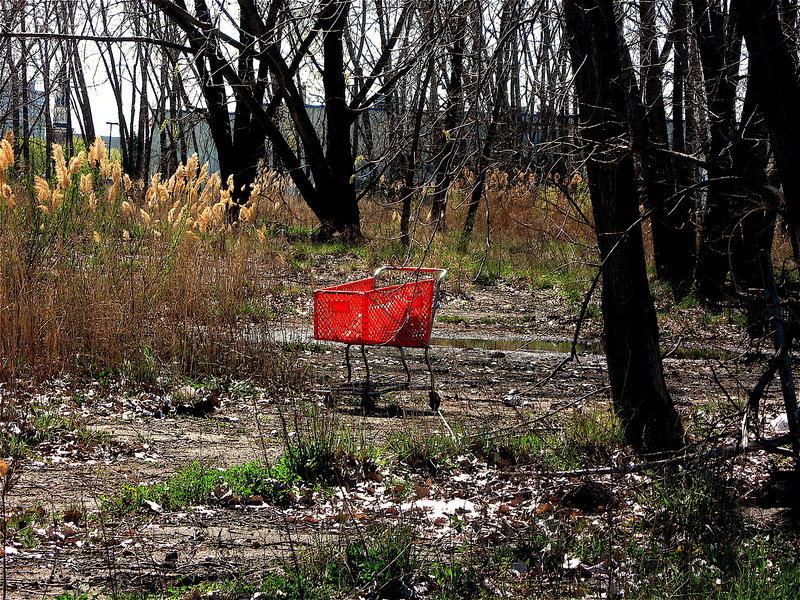 What’s with all the stray shopping carts scattered across this city? While riding around the streets of Detroit, I see them everywhere. 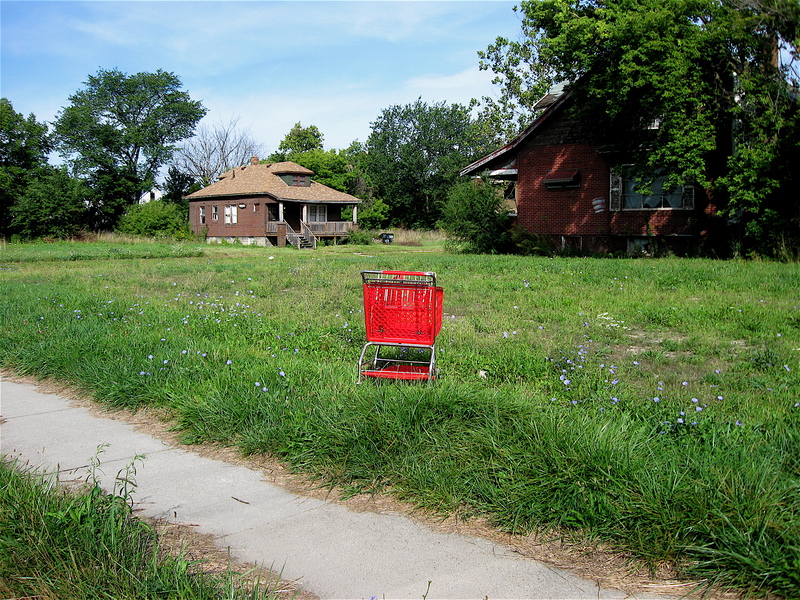 They’re in weed filled fields or lots; in the yards of vacant homes; on pedestrian free sidewalks; and some are randomly parked in the middle of a street that is lined with manufacturing facilities. 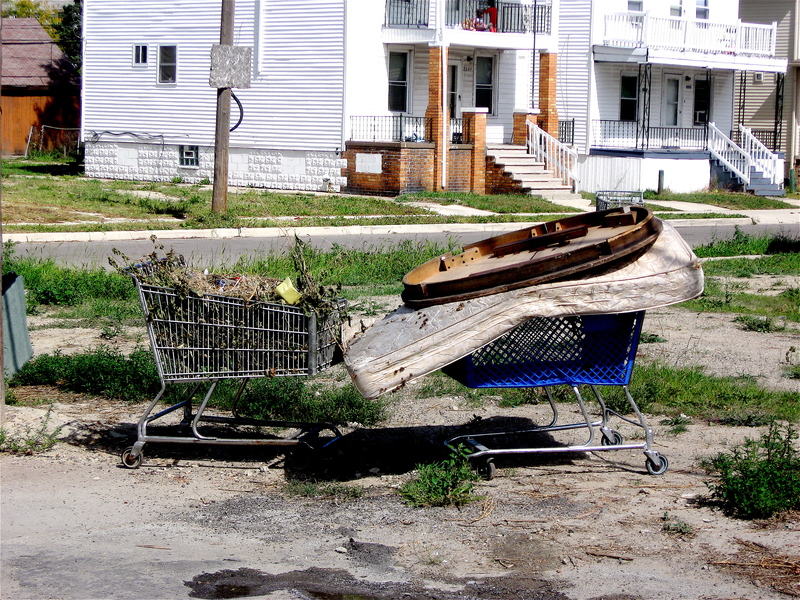 The odd thing is there are usually no food markets or other retailers in the area where I see many of the vagrant carts. In fact, there usually isn’t any businesses within blocks, or in some cases miles, that may have the carts available to their shoppers. 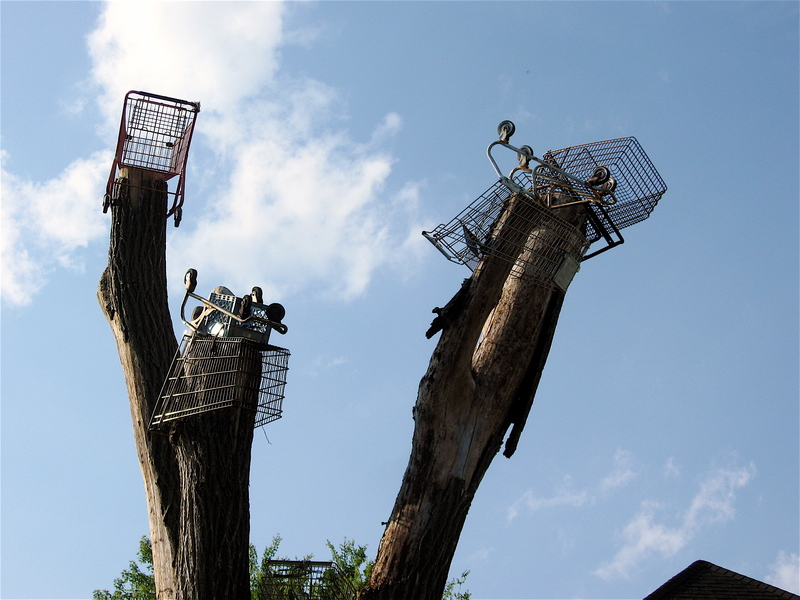 It’s as if the derelict carts were magically dropped from the sky to their special place in a field or street. 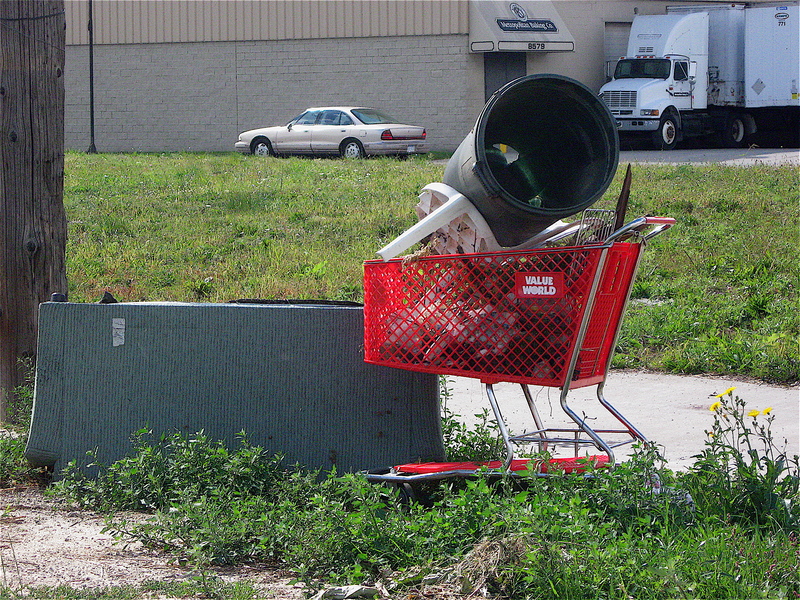 The abandoned metal and plastic 4-wheel carts I see are used in many ways. I’ve seen them piled high with what appears to be trash. Others are filled with old mattresses, wood, metal debris, and various urban treasures. 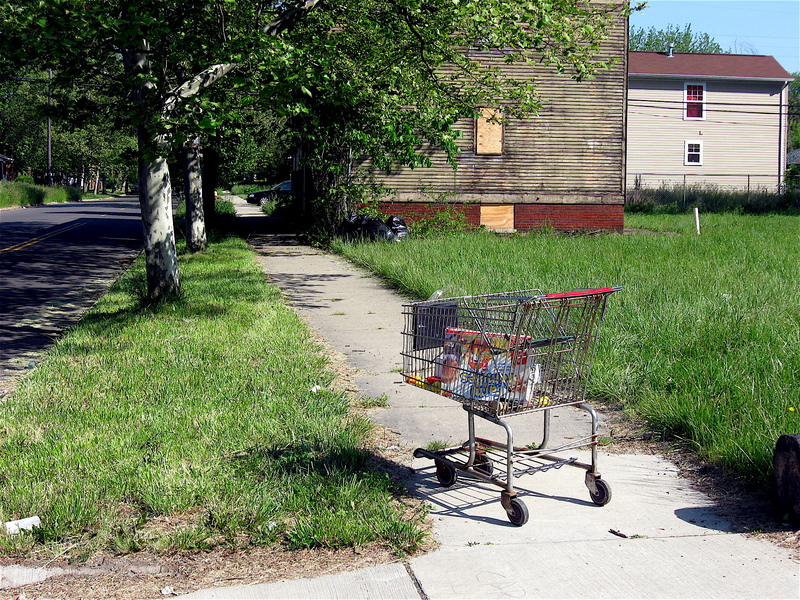 I also see poor people slowly pushing carts filled with scrap metal along lonely streets. I can only assume they are on their way to a nearby scrap yard in hopes of making a few bucks by selling the junk they managed to collect. Generally, it seems they are being used by impoverished people as haulers to move their unusual stuff, as if they were major freight transporters delivering produce or products across the city and beyond. Street-smart entrepreneurs also use them as mobile stores. I’ve seen the buskers pushing carts full of candy, pop, potato chips, and other miscellaneous items along sparsely populated streets yelling out, “Everything is a dollar.” They remind me of ice cream trucks that work the streets, but without the loud obnoxious music. 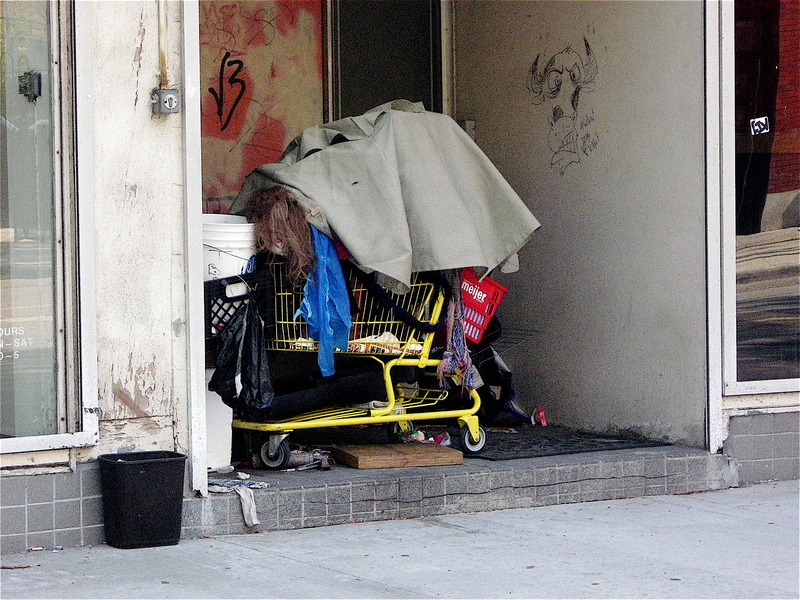 Sadly, the homeless and unfortunate people of this city use them to store and transport their meager goods. The carts they push along at a crawling pace are usually packed full and overflowing with trash bags and other small make-shift containers, all stuffed with their worldly possessions. Lighted buildings were everywhere in Midtown Detroit last Saturday night. 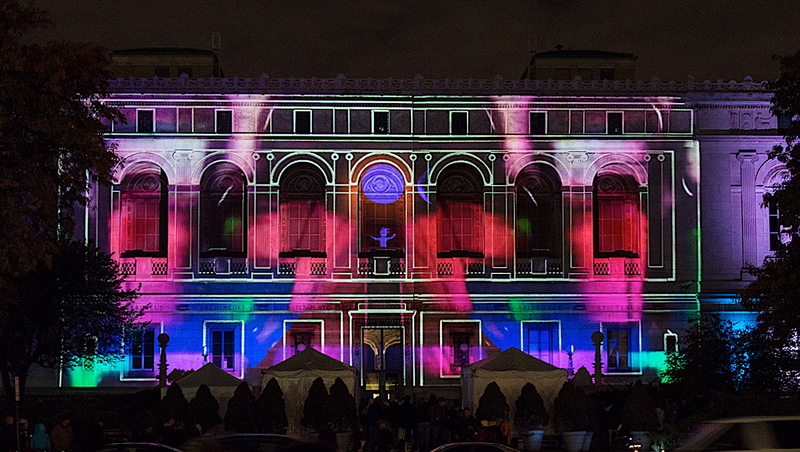 Thirty-five local, national and international artists illuminated many of the historical buildings in the neighborhood in a variety of eye-catching colors and video productions, some in 3D. They were all there as part of DLECTRICITY, a contemporary light art festival that drew thousands of people including those, like myself, on bicycles. As it turned out, bikes were the perfect way to view the colorful light displays spread across the many neighborhood streets. Right before Saturday’s sunset, hundreds of bicyclists converged in a parking lot at the corner of Second and West Warren Avenues for a light bike workshop. 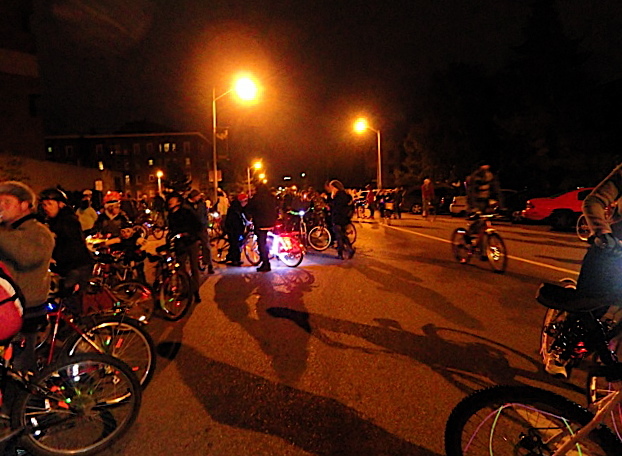 There, riders were given a variety of LED lights and other reflective devices that we mounted to our bicycles in preparation for a 3-mile Light Bike Parade that rolled out of the parking lot at 7 p.m. 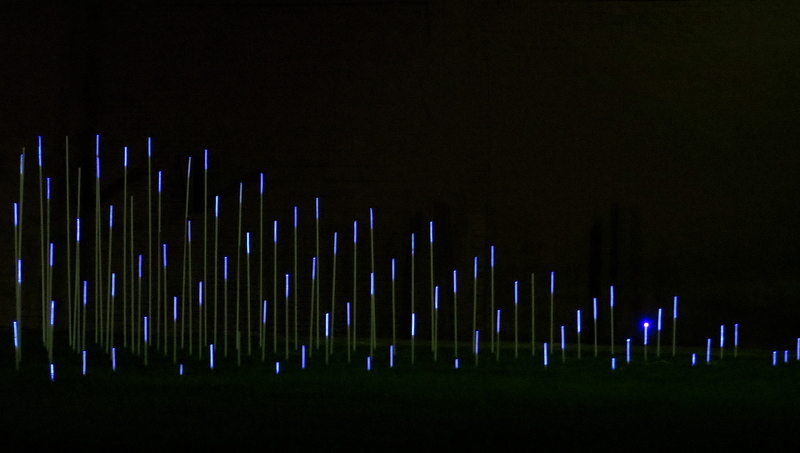 The blinking, flashing and glowing bikes headed north on Cass Avenue to the city’s New Center Avenue. From there we pedaled over to Woodward Avenue and headed south through the heart of Midtown, where thousands of people lined the streets clapping and cheering as we rode by on our way back to the starting point. Once the ride ended, a group of us got together and bicycled throughout the Midtown area looking at the incredible lighting displays. Although every building selected for the artists to work their colorful magic on was unique in its own way, there were a few that really popped for me. 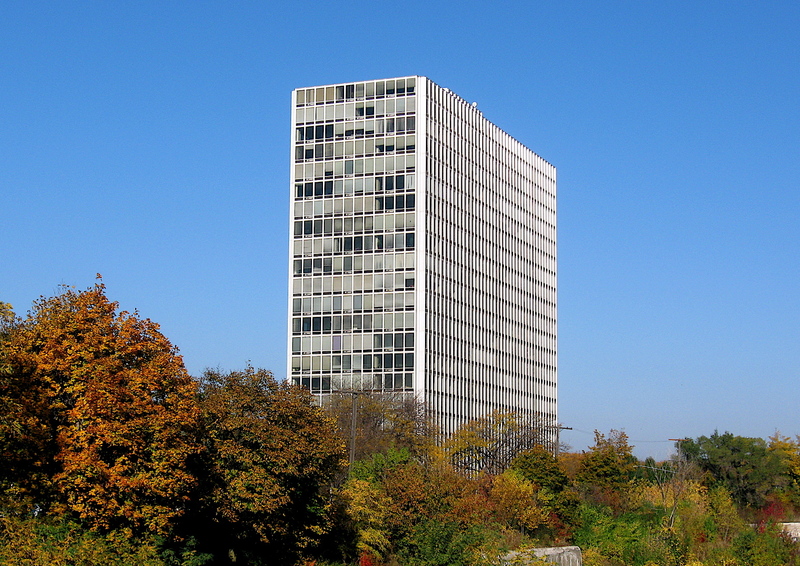 The first was the Garfield Building at the corner of Woodward and Garfield Street. It featured an ever-changing variety of colors superimposed on the exterior brick that lined the windows. 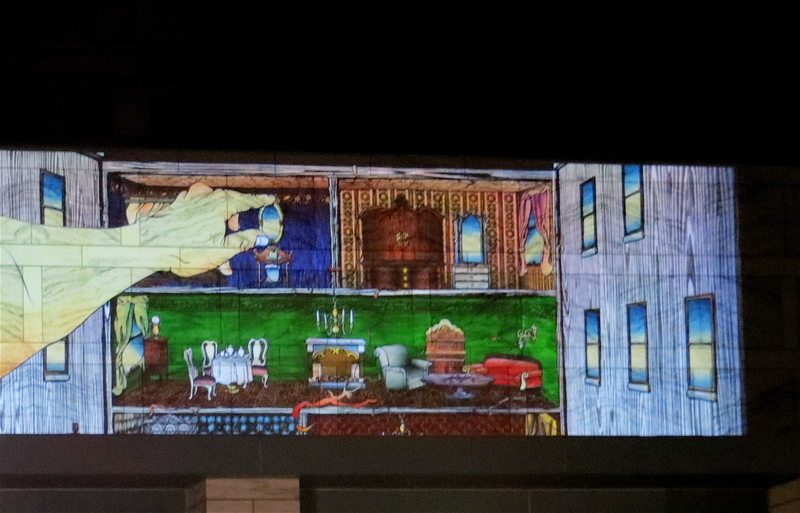 The windows themselves had darker, moving images that were in stark contrast to the brick outlines. It reminded me of something right out of Times Square, but without the advertising messages (first building in the WDIV video below). Another highlight was the front of the Detroit Library on Woodward Avenue. 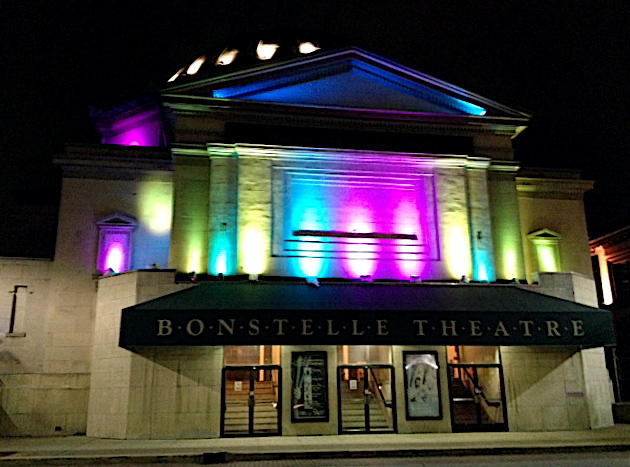 The constantly changing lights outlined and highlighted the arches of the building, while colorful lights and ghostly images of people moved across the building. At one point, flames were shooting out from above the front door. It looked as if the building was on fire. 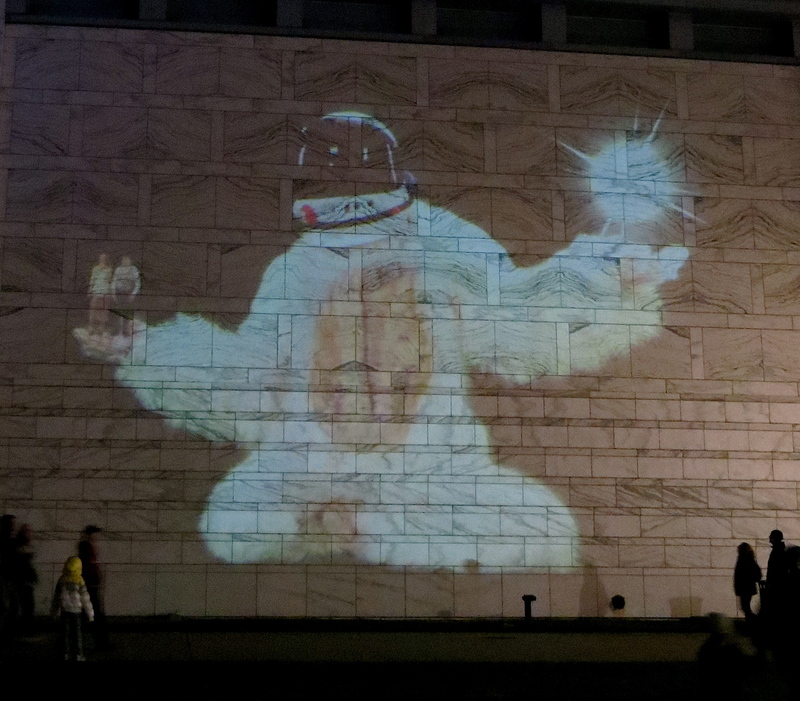 I rode past the library many times Saturday night, and I never saw the same thing twice. By far, the highlight for me was a simple design called “The Climb”. It was a piece that I accidentally discovered on the backside of the Sugar Hill Apartment building as I was cutting through an alley on my bike. It consisted of two thin, staggered zigzag white lines that outlined some of the building’s bricks and windows from top to bottom. 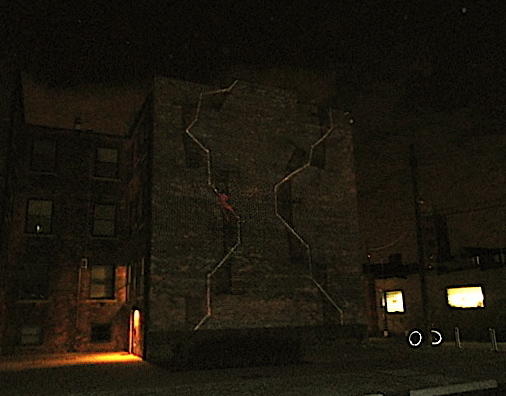 On the white lines, beginning at the bottom, was a red image of a person climbing up the white lines to the top of the building. It included ghostly images of the climber stretching to grab bricks, secure safe footing and taking seated breaks in on the window sills half way up the building. It was incredibly real and mesmerizing. Riding throughout the event I was impressed with the variety of work and the size of the crowds who came out in force. Woodward Avenue and the surrounding streets were jammed with people, even at midnight as I was heading home. A big thanks and kudos goes out to the organizers for putting together this spectacular event and to the many artists that displayed their work. It was great! Click on any of the names below to check out more Videos and photos from the event. The mile long Dequindre Cut Greenway is a Detroit gem. It runs from the Detroit River north to Gratiot Avenue, where it is fenced off. 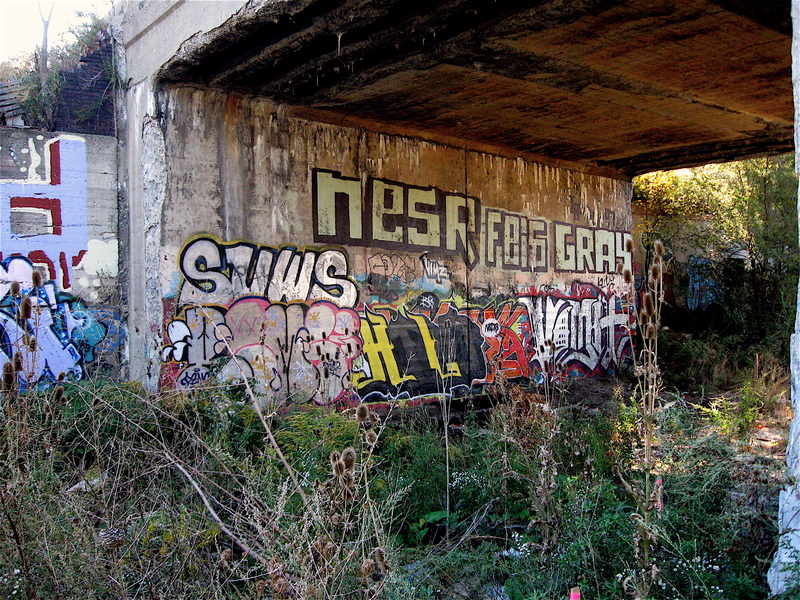 The below street level Greenway was once a foreboding weed choked abandoned rail line where graffiti artists worked their spray-can magic. It was strewn with trash and was also a place where homeless people had set up camp. A few years ago, the Detroit RiverFront Conservancy received a $3 million grant to convert it to an urban Greenway. 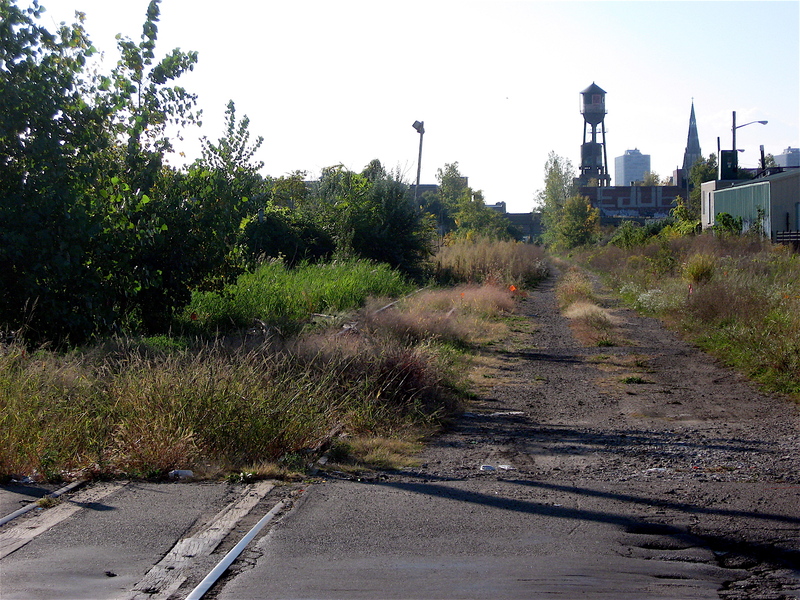 With the funding, the old Dequindre Cut rail line was cleaned out, and a paved landscaped trail was added. It is now used by bicyclists, roller-blade enthusiasts, runners, skateboarders and casual walkers. 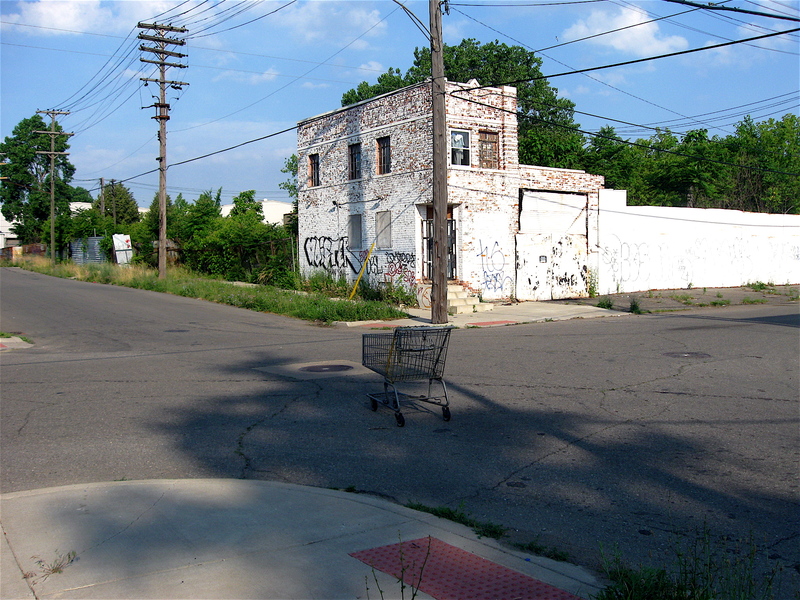 From what I understand, funding has recently been secured for development of the second phase of the Dequindre Cut Greenway that will incorporate the half-mile section beyond the Gratiot fence, further north to Mack Avenue. 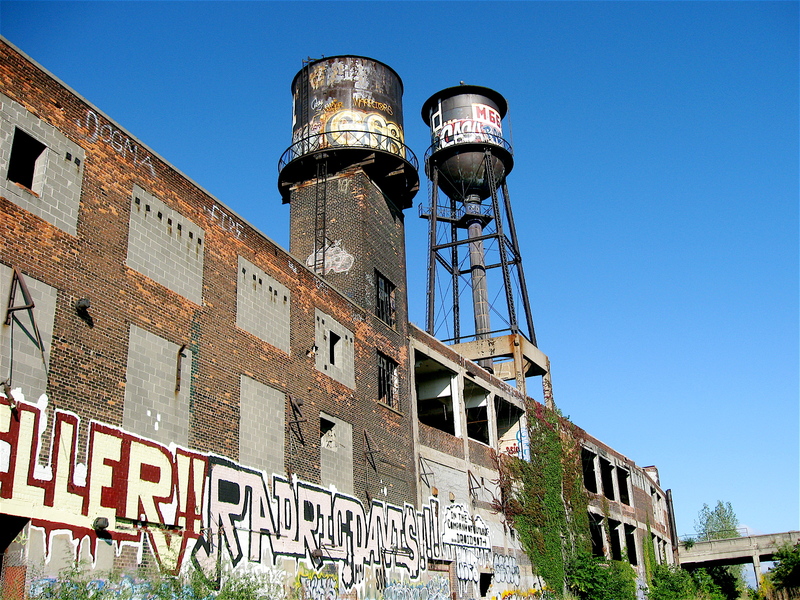 It will include access to Detroit’s Historic Eastern Market. 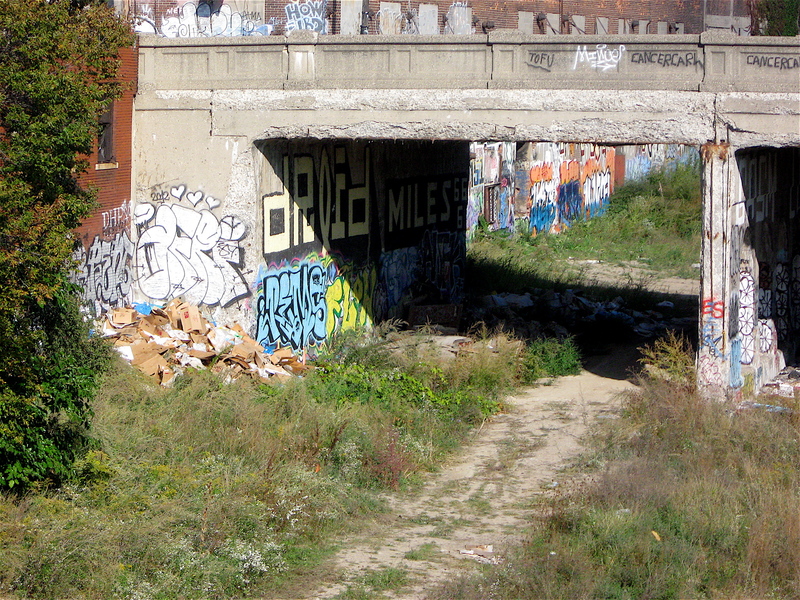 Like the pre-developed original section, this half-mile long stretch looks a bit seedy from the street overpasses with wild plants, trash and run down, abandoned factories lining a big chunk of it. Having walked the original phase I prior to development, I decided to check out this undeveloped section before work begins. I pedaled south along the two-track gravel path off Mack into the abandoned railway that gently slopes downward. 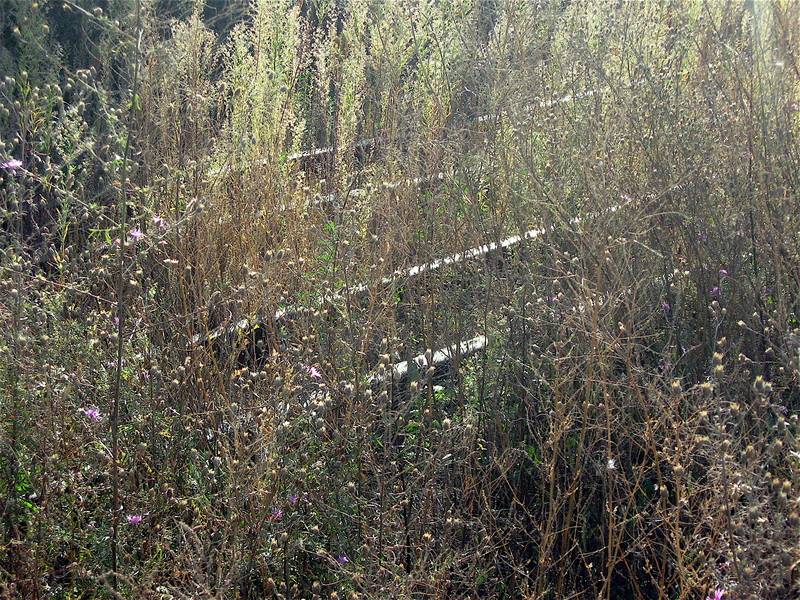 Before entering into the cement encased section below ground level, I could spot the old rails shining through the overgrown, dense weeds that have taken over. 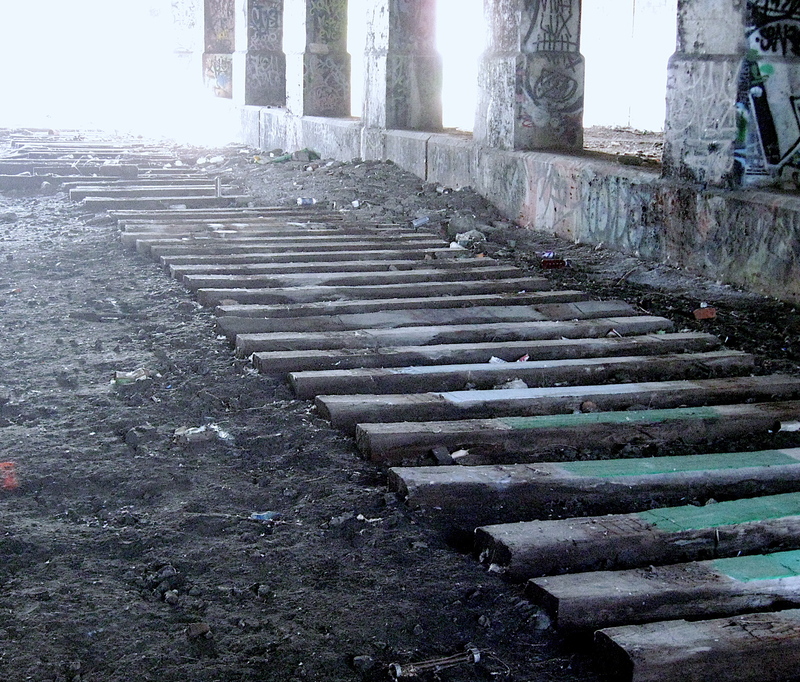 In some areas along the path, the rails have been removed leaving perfectly spaced, heavy wooden ties that reminded me of piano keys. Much like the original phase I section, the graffiti artists have worked their colorful, fascinating magic along the barrier walls and on the many bridge overpass supports. In one area below a crumbling street overpass, there were piles of trash that looked as if someone recently dumped it from above. 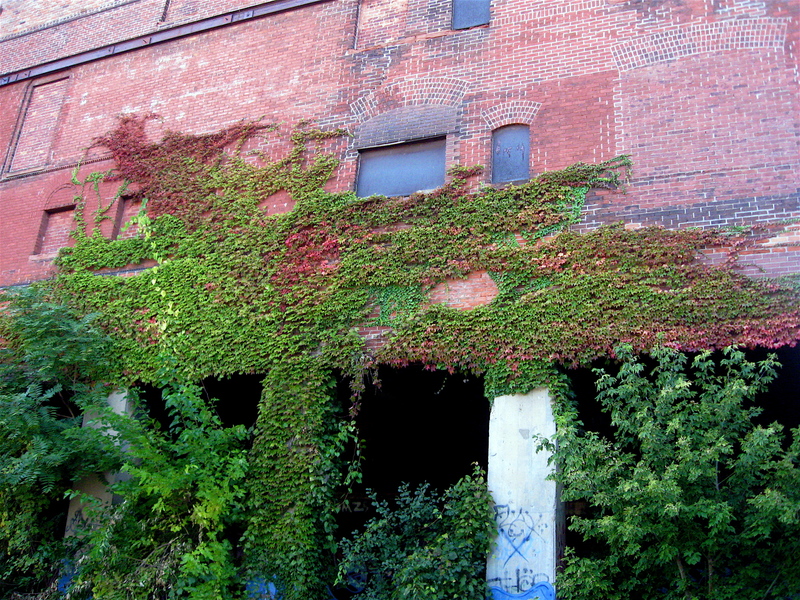 One of the most striking things about this half-mile section is the architecture of the abandoned manufacturing buildings. Many of them appear to have been built-in the 1920s or 30s and feature some outstanding brick work, especially above the windows. Others are utilitarian in design, perfectly aligned next to each other creating a seamless straight line of brick that stretches quite a ways. Looking at the places, I couldn’t help but think of the many thousands of people that once worked in them and the trains that used the rail line to deliver and pick up raw materials and manufactured goods. 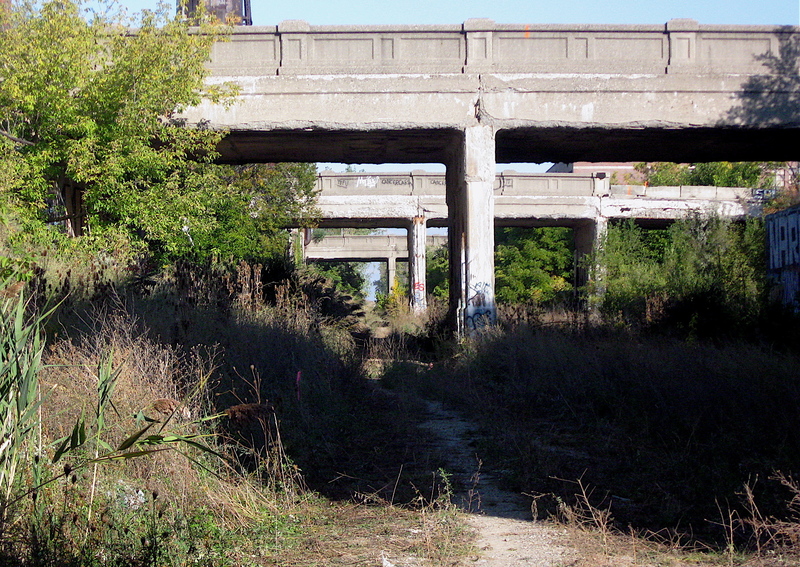 It will be interesting to see how the second phase of the Dequindre Cut Greenway development shapes up.